The Hoy Creek Quilters are a group of about ten core quilters, sometimes more as ladies come and go from their group. Using recycled scraps, the quilters construct their blankets for the RCMP (or Royal Canadian Mounted Police, for those of you who don’t live in Canada) to give to trauma victims. Every year the Hoy Creek Quilters come to the Port Moody Station Museum on Canada Day to demonstrate their craft in the station’s former waiting room. 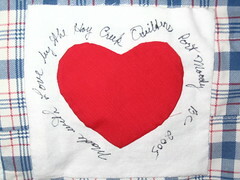 On Canada Day 2004, the Hoy Creek Quilters decided to turn their attention to us. 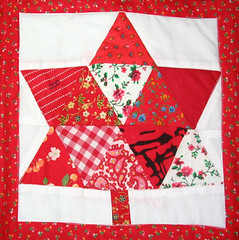 They decided to sew a double-sized maple leaf quilt to raffle off in 2005 as a fundraiser for the Museum. It took them a year but they got the quilt ready for July 1, 2005. We chose that date to launch our raffle ticket sales. 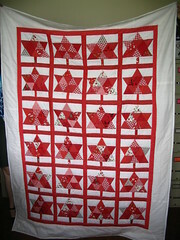 The quilt was to be top prize, with an estimated value of $500. Other Port Moody businesses, the Stylin’ Divas Salon and the Flying Fish Grill were also generous with prizes. This gave us four months (as per our gaming event license) to sell the 500 tickets. We chose the night of the Murder Mystery Dinner as the draw date. At 9 PM sharp that night someone won the quilt. This morning that someone arrived to pick up the quilt.